If you’re wondering why U.S. military personnel heading to West Africa to help stem the tide of Ebola are taking part in Operation United Assistance, and the troops heading to the Middle East to fight the Islamic State group are still taking part in a no-name operation, just watch ABC News’ recent interview with Gen. Martin Dempsey, the chairman of the Joint Chiefs of Staff. Listen to his tone. Look at his face. Take note of his delivery. You will see a tired and dejected man who wants to crawl into a corner and stay there for weeks because he knows that he has been given a task from his worst nightmares. Martha Raddatz: What are you hearing? What are you seeing? Gen. Dempsey: Well, it may be about to fall. The ISIL fighters have been putting pressure on the outskirts of the city and in fact into the city itself. And in fact I just got off the phone with my Turkish counterpart about it. Martha Raddatz: And what did they say? Gen. Dempsey: Well, they are obviously tracking it just like we are. They’ve got forces on their side of the border that will prevent ISIL from making any incursions into Turkey, but of course ISIL is smart enough not to do that. I am fearful that Kobani will fall. We have been striking when we can. ISIL is a learning enemy and they know how to maneuver and how to use populations and concealment, and so when we get a target we will take it. Martha Raddatz: And when you talk about ISIL and ISIS blending into the population, what are you seeing? How are they doing that? 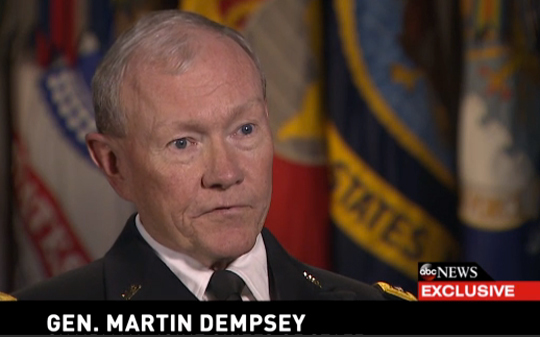 Gen. Dempsey: They’re becoming more savvy with the use of electronic devices. They don’t fly flags and move around in large convoys the way the did. They don’t establish headquarters that are visible or identifiable. There are ways that over time we can learn about them as they adapt, but they are changing. If you have a roach problem, and all you do is spray some insecticide on the critters every time they crawl across the kitchen floor, then you will always have a roach problem. In fact, they will continue breeding in the walls of your home. Slowly but surely they will make your home their home, and they will continue to do so until you are prepared to seriously deal with the problem. Likewise, random airstrikes on the Islamic State group each week will not root out the terrorist organization from its well-entrenched positions in Iraq and Syria. Now that Marine Cpl. Jordan Spears is officially the first military death in President Obama’s no-name operations against the Islamic State group, people will begin to ask what he died for. The price tag (roughly $1 billion for three months of airstrikes) will also put pressure on the Obama administration to name its ongoing military engagement. In time, one would think the White House would be forced to relent, but there should be no mistake as to why the foot-dragging is taking place: no one wants to name their own failures. Just as the Islamic State group has adjusted to changing conditions on the ground, it is possible for the Obama administration to adopt a winning strategy. Hopefully, men like Gen. Dempsey will repeatedly tell the president what he needs to hear behind the scenes until Mr. Obama listens to reason. Painful. I heard Dana Perino say yesterday that many top level security and intelligence positions in the Obama administration have been vacated by the mass exodus of those who can no longer tolerate working for this man……..AND……they haven’t been filled again. I cannot wrap my mind around what it is he’s trying to do. Is he deliberately trying to destroy our country as many say? Is he really a Manchurian Candidate as my dear mother (God rest her soul) actually believe? Or is he simply a bumbling, incompetent fool? I generally don’t like to attribute to malice what can be explained by ignorance or a blind allegiance to a fundamentally-flawed ideology. I think Obama is a smart man, but I think “leading from behind” blew up in his face and now he doesn’t know what to do. He has a problem on his hands that, on many levels, only American might can solve, but he doesn’t want to use the resources at his disposal. He wanted so badly to believe that if the U.S. tried to wash its hands of world affairs that dictators and despots and bad actors around the world would stop attempting to widen their own spheres of influence. Mr. Obama is learning the hard way that the real-world does not work like the vast majority of theories bandied about in the teachers’ lounge. So, I guess we need to have a debate over what “smart” means. Where has he been in his formative years of life that he actually believes that evil doesn’t REALLY exist, it is only a reaction? They don’t work in the teachers’ lounge either. the game is still regime change for Assad and the balkanization of Iraq. thought you might be interested in this news article. Thanks for sharing. I appreciate it. It’s hard to comment on this article because in I understand his frustration and think much of what he says is true, but he ultimately comes to some bizarre conclusions. He’s on point when he says that not being able to accurately define makes defeating him darn-near impossible, but then he also implies that the war on terror should have started and ended with al Qaeda. That sounds great, but the reality is that there are plenty of other groups (e.g., Islamic State) that share al Qaeda’s ideology. As long as we have politicians who are unwilling to call group’s like Islamic State “Islamic,” we will continue to founder in our efforts protect free citizens from barbarians.